We took a look at all the top Florida boys that will be competing in the championship events this weekend at New Balance Nationals Indoor. This year Florida will have two of it's fastest milers representing the state at NBNI. Bolles senior, Chase Rivera, was the boys Emerging Elite mile champion last year in a time of 4:14.69. Rivera has yet to run indoor this year, but he has raced a 4:15.57 1600m outdoors in rainy conditions and several 800m races to prepare for this mile. Hugh Brittenham, of Estero, had a breakout run at the Mondo Elite Invitational running a 4:17.68 mile to win the boys Elite division and to capture a new PR. Since then, Brittenham has raced a few 800m and one 4:19.35 1600m two weeks back. To put these times in perspective, last year Dustin Horter won the boy Championship mile in a 4:08.03. It will take achievable personal records for both of these boys to be amongst the top five, but as their recent training demonstrates -- they are ready for another breakout performance. Bolles senior, Charles Hicks, had a breakout performance at the Bolles Bulldog Classic racing the 3200m in a 9:09.42. Although he has not raced indoors once this season, Hicks has been working on his middle distance speed, getting his 800m time down to a 1:55.61 to with the East Coast Classic in mid February. Last year, Brodey Hasty of Tennessee, won the boys Championship 2 Mile in a time of 9:00.38. With a 9:09 already under his belt and a PR of 8:58 as well as new middle-distance training under his belt, Hicks is expected to be among the top five contenders in this race. Lake Brantley senior, Joab Francois, comes into the boys Championship 800m race with no indoor races this season and with a lot of work on his speed. Since February, Francois has worked on his 400m speed the most out of any other event. Francois won the 400m at the Windermere Meet of Champions meet, running a time of 49.30, just missing his PR by three-hundredths of a second. Back in early February, Francois raced a 1:59.30 800m. With more speed work under his belt, and an outdoor PR of 1:51 Francois is due for a breakout 800m race and NBNI might be the best race to bring it out. IMG Academy junior, Ruben Banks, will be competing in the Boys Weight Throw Championship. Banks comes in with a weight throw PR of 19.06m that he threw at the FasTrak High School Invitational indoors in February up in Houston Texas. 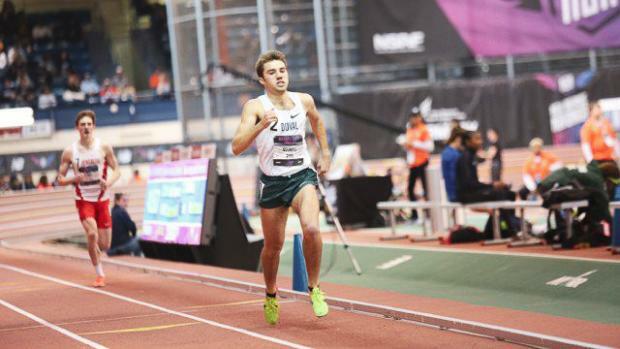 This will be Banks first New Balance National Indoor meet and he comes in with a PR that would have earned him a top 20 finish at last last year's national meet. IMG Academy junior, Zechariah Blake, will be competing in the Boys Shot Put Championship. Blake has yet to compete indoors this season and he comes in with a 15.6m PR that he threw last weekend at the Lakewood Ranch Invitational along with a 47.75 discus PR. Last year, Patrick Larrison of Oklahoma City, won the event in a 20.57m throw. Blake comes in ranked amongst the top 26 in the event. Palm Harbor University junior, Gage Knight, and Berkeley Prep junior, Markus Bynum, will be representing Florida in the Boys Pentathlon Championship. Both juniors have not competed indoors yet this season and will be making their debut this weekend at the Armory. Both Knight and Bynum have been competing outdoors since early January working on mastering their craft in the throws and jumps. Knight comes in this season bests of 23.15 in the 200m, 51.65 in the 400m, 6.43m in the long jump, 32.73m in the discus, and 10.72m in the shot put. Bynum comes in with 53.71 400m season best, 1.77m high jump PR, 6.28m long jump best, and 11.28m shot put PR.